This gif file speaks for itself. 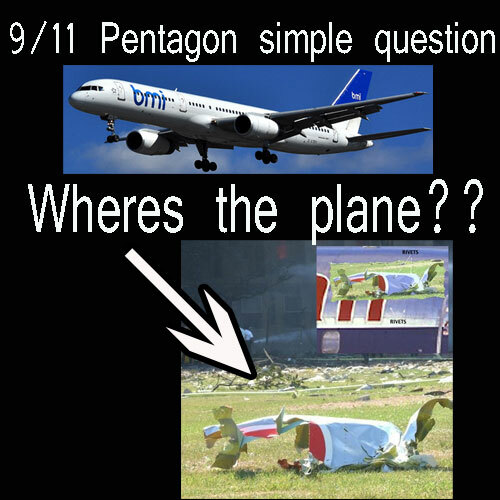 Notice the clearly seen small sized missile captured in frame #2 with no wings, no American Airline massive logo that is supposed to be seen on the front side of the plane. 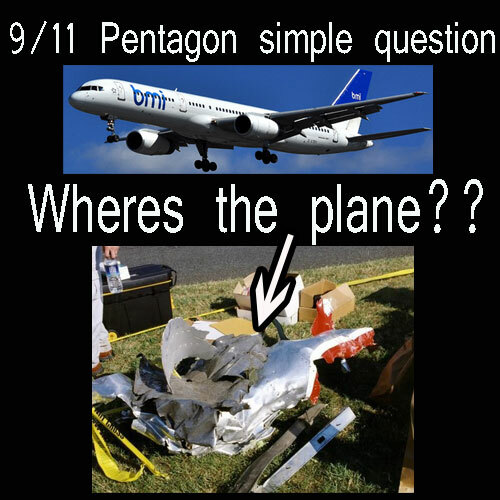 There is nothing about this object that suggests this is flight 77. 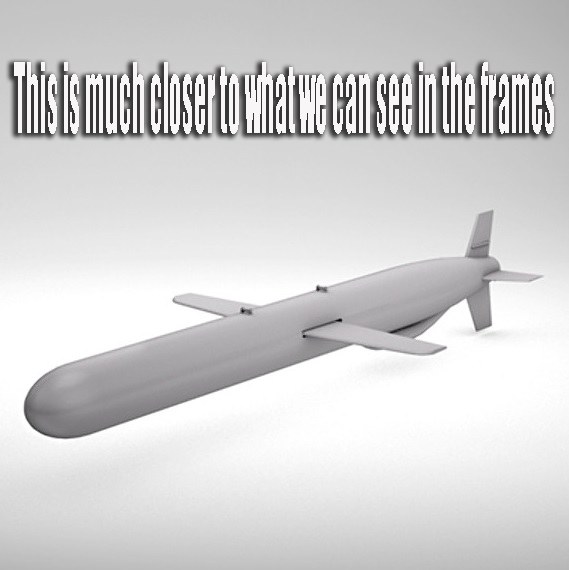 Instead everything in this object is consistant with military Tomohawk cruise missile. 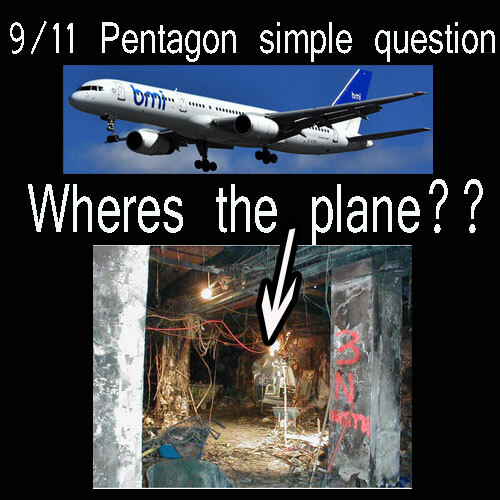 This is another reminder that 9/11 was a U.S. military-intelligence operation which the U.S. military and intelligence would rather you blame on al-Qaeda, Saudi Arabia or even Israel. 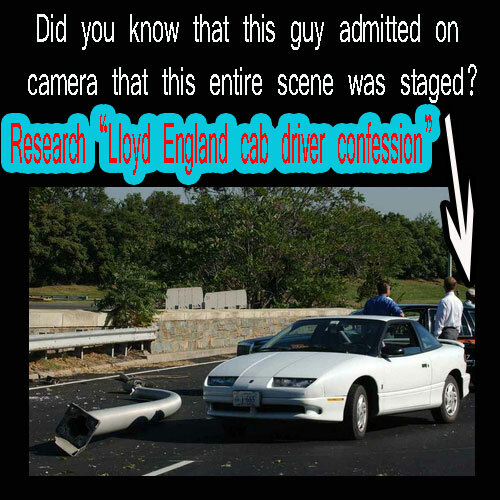 Do not be fooled. 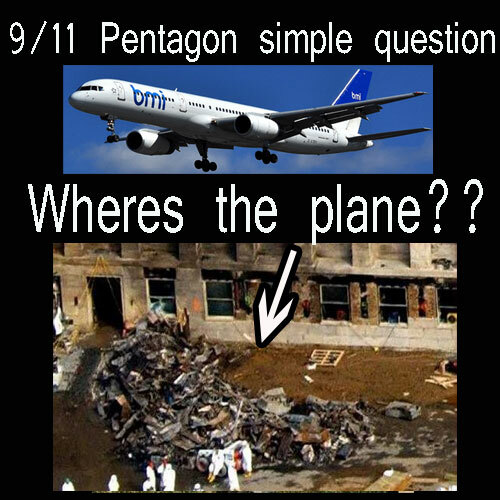 See related 9/11 article here titled '9/11- The Art of Blaming Others'. 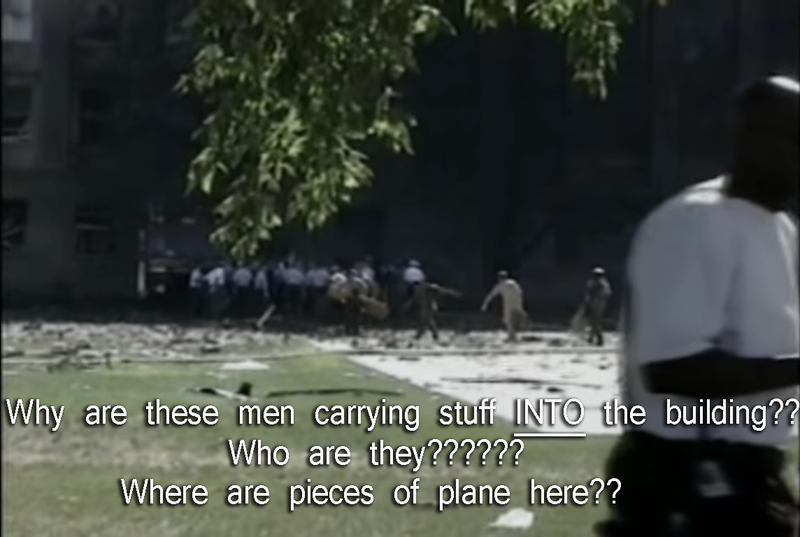 Some believe the missile clearly seen in the frame itself is a psyop. 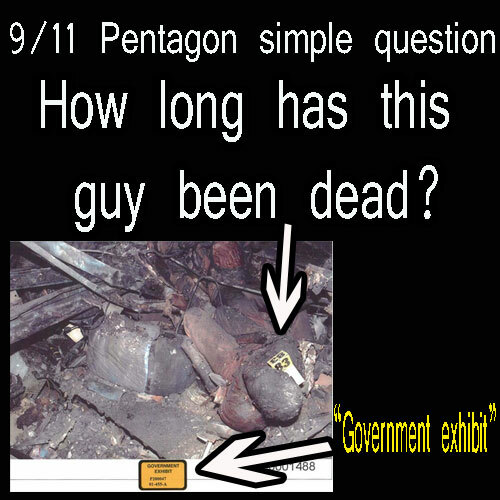 Admittedly anything is possible with a government that hides all the evidences and lies to the general public. 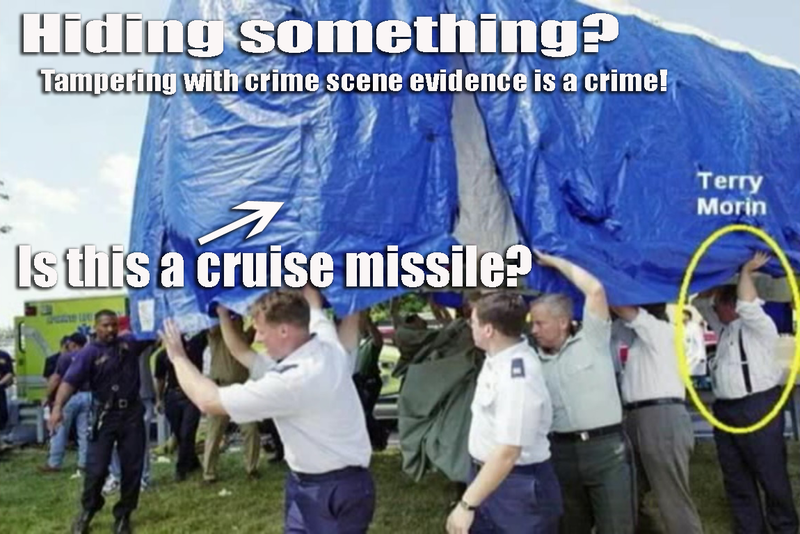 However, considering the damage to the building and the available testimonies, to the critical thinking mind the collective evidence points to a cruise missile strike. 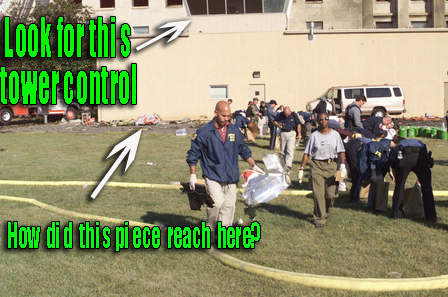 Did a bomb go off inside the building also or instead? 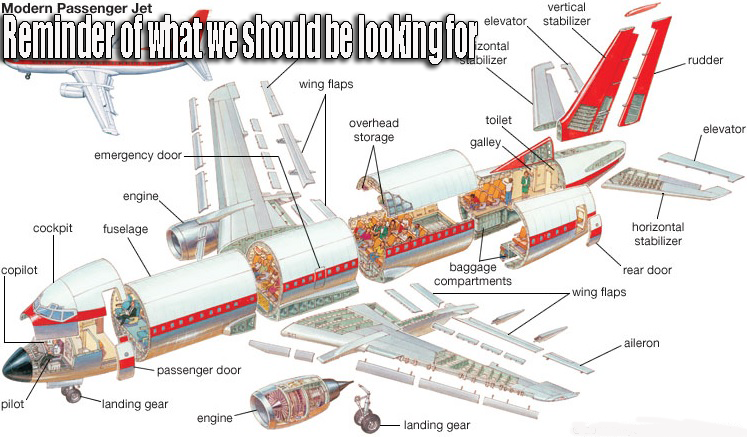 That is also possible but the cruise missile evidence still out-shines this possibility. 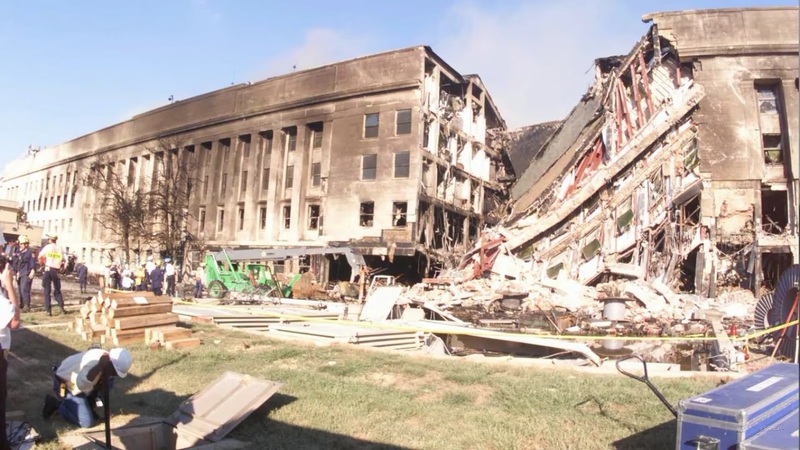 The famous C Ring hole (see images below) proves some form of energy the size and shape of a cruise missile destroyed the wall at the deepest level of the building (three sections deep!) 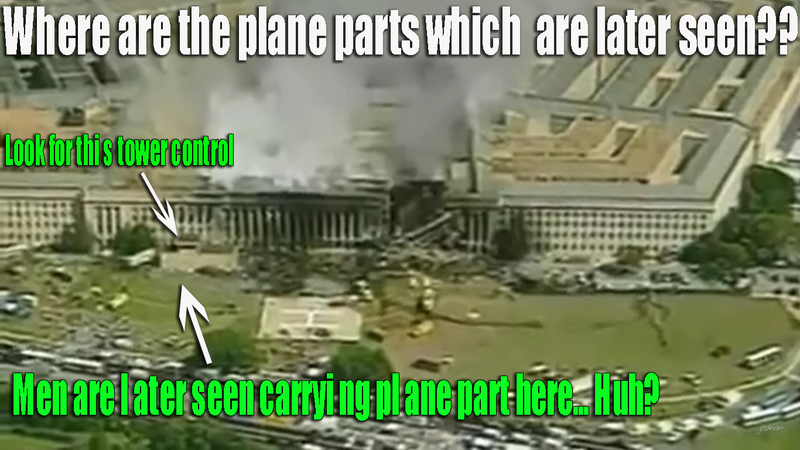 in the direction you would expect from a mid-air cruise missile hitting the building. 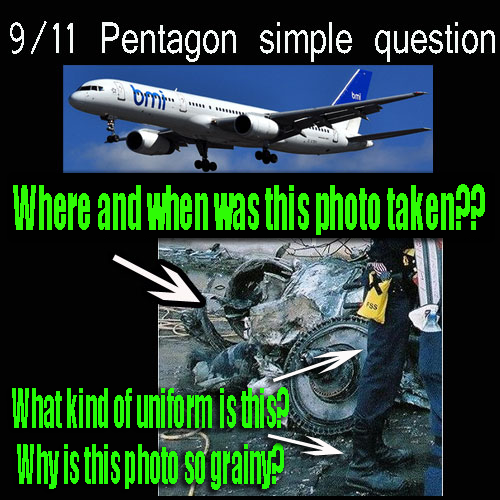 The secrecy shown at the Pentagon with agents illegally moving, placing and confiscating debris, a process Donald Rumsfeld himself contributed to, highly points to the fact that there was an urgency at the Pentagon to coverup evidence and that something very large was being removed that the government didnt want you to see (See images below). 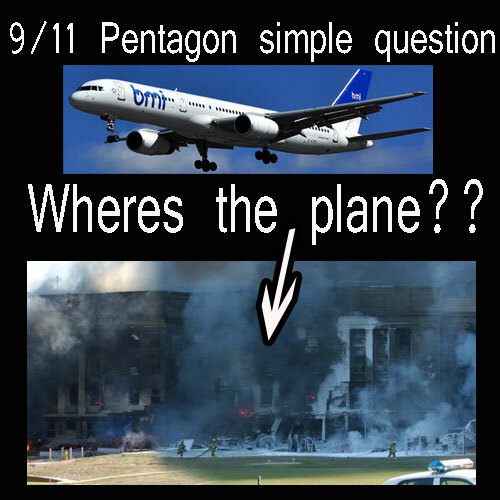 Evidence later seems to have been placed at the scene to match the ridiculous official story even though none of the reporters initially on the scene or any of the employees at the Pentagon saw ANY plane parts whatsoever. 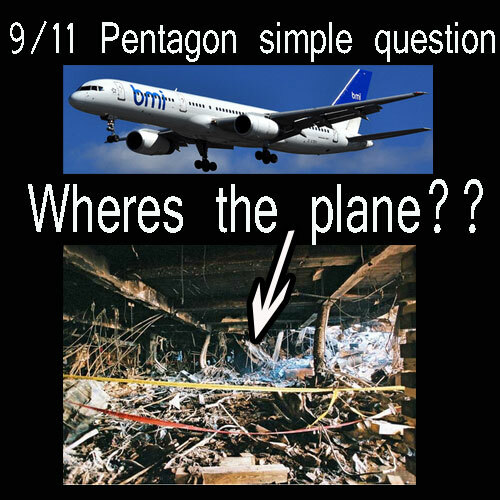 This towering non-evidence for a jumbo jet 757 packed with people luggage and fuel confirms beyond a shadow of a doubt that AA Flight 77 did NOT strike the Pentagon and the official story is one big lie. 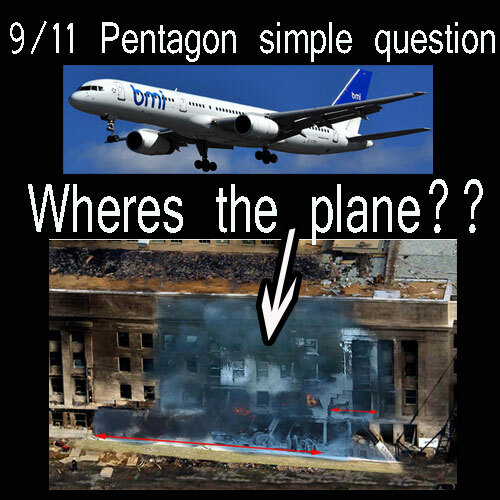 Above and beyond this evidence there is much more evidence provided by pilots and aviation experts including Pilots for 9/11 Truth that entirely debunks the notion that any jumbo jet flying at 530mph would be able to pull off the maneuvers claimed in the official story. 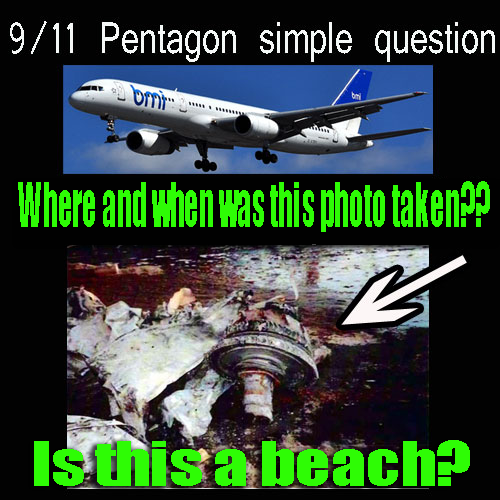 In the following photos below supposedly showing the plane parts "evidence" realize that these images were conveniently released by the Pentagon (hint!) 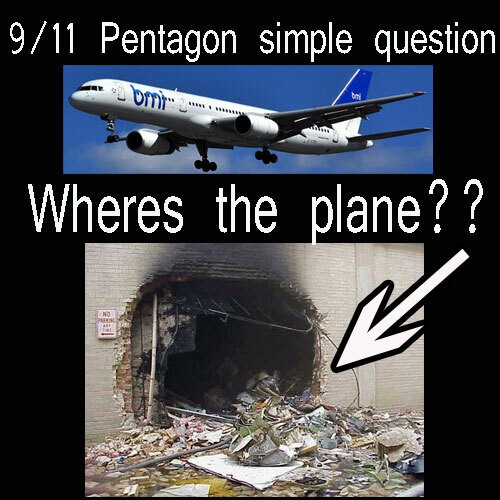 much later after 9/11. 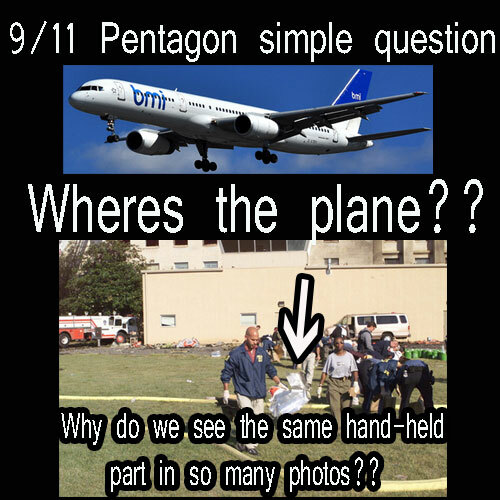 None of these images appeared in any of the mainstream media coverage of 9/11 at the time of the event including any of the magazines (TIME, LIFE, Newsweek, U.S. News and World Report, National Geographic etc) that would normally be expected to push the official story. 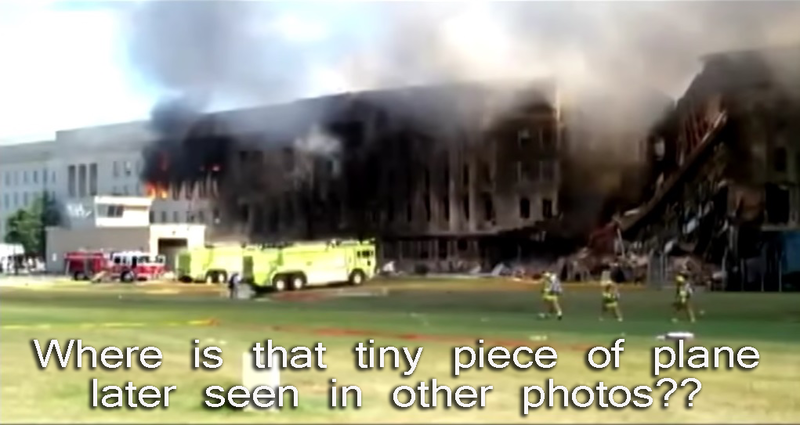 No one in the media presented any of these images at the time because these staged images were not available yet. 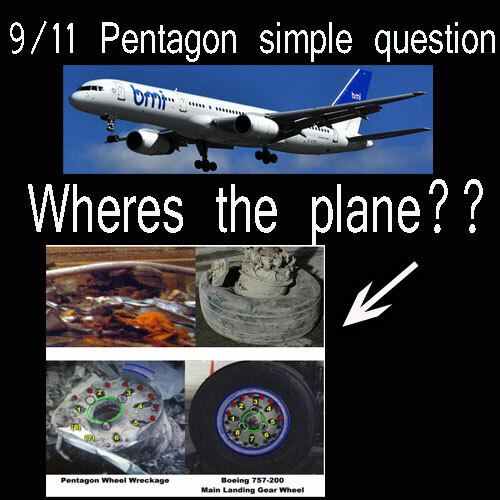 Furthermore, notice how the supposed images of the plane mechanical parts are all very close up which means these images could easily be from another crash. 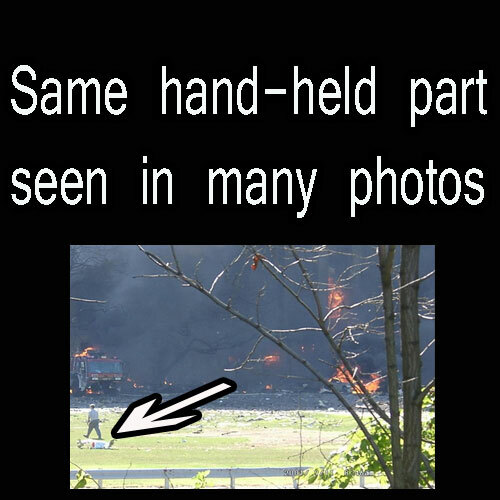 One hint to this (I believe) very obvious deception is notice the strange color hue on some of these sketchy photos. If they were all taken around the same time why does the age of the photos in some look so different? 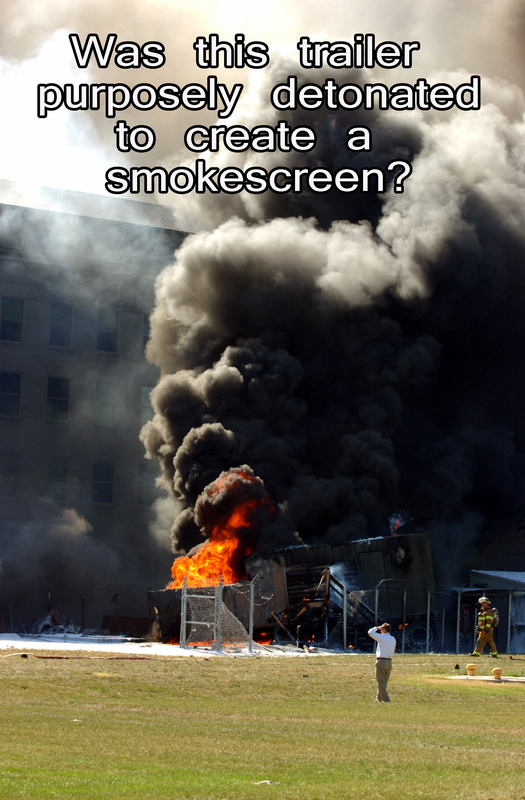 Doesn't this look suspicious to you?? 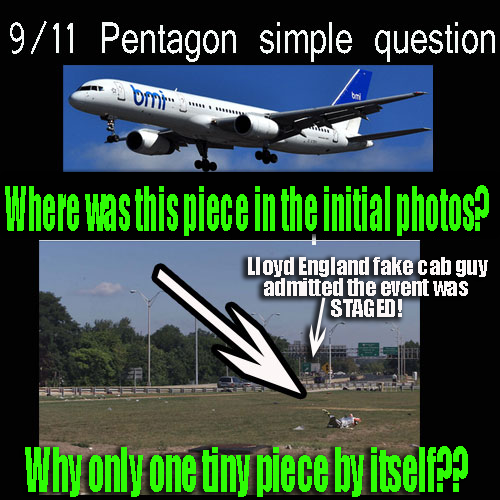 Pentagon" story is one big psyop lie.